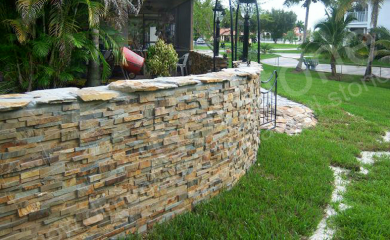 Usually a typical stone wall would be considered for a project outdoor, right? Not always. 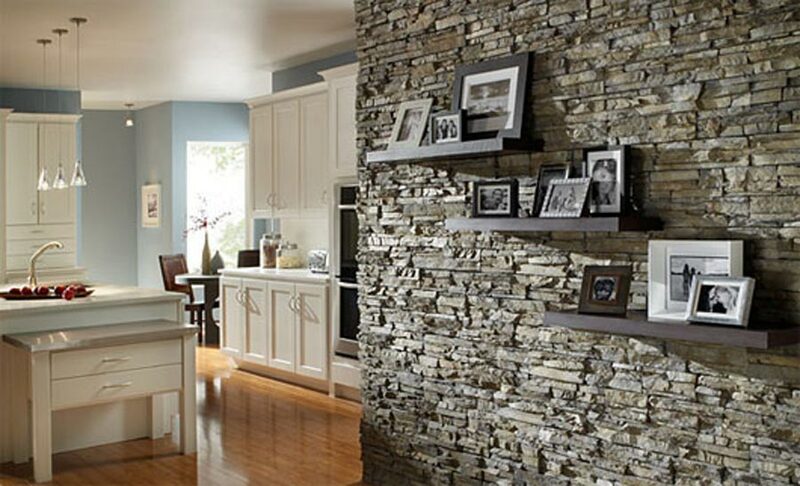 Many builders, designers and home owners are also incorporating a stone wall look with stacked stone or brick panels for some interior accents. When it comes to the outside or inside you can avoid the very hard-to-accomplish real stone wall. Imagine what it takes to build one in the traditional fashion; grade the ground, build a trench for the foundation, build the actual foundation which often requires hiring at least one helper and a concrete truck. Let’s not forget having to build the form, bend and shape the rebar etc. There is a better alternative which will actually make the project fun. With faux stone wall panels from places like Faux Stone depot, Antico Elements, cheapfauxstone.com etc. it’s a breeze. All you need to do is install 4×4 posts in the ground, just like you would do for regular pressure treated fences, create a framing system in between the posts the same you would for an interior wall ( 16 inches center stud ) then glue and screw the panels over the framing. The top can be easily capped with the top sills or any of the stone molding. This is even easier since most home and offices have the structure already built. All you have to do is grab the faux stone sheets, use some adhesive and screw of nail them on the existing wall. Ideally you would drive the fasteners right where the studs are. The stone panels types come from the online catalog and it can get it delivered to you in only 3 days ( for most locations ). This alternative type of stone veneer panels can be installed virtually anywhere where adhesive, screw and nails can be used. This entry was posted in Ideas and tagged Faux Stone Wall, Imitation Stone Walls, Indoor Stone Walls, Outdoor Stone Walls, Stone Panels Construction, Stone Wall Materials, Stone Wall Panels by SFauxPanels. Bookmark the permalink.